ANCC (American Nurses Credentialing Center) Magnet Recognition is a top honor which recognizes a hospital’s nursing excellence. Several of the fourteen “Forces of Magnetism” which characterize a Magnet hospital, are directly influenced by a librarian’s involvement. Forces in which librarians actively participate will be discussed. Librarians provide a key role in these areas by providing instruction, research expertise, and by being collaborators. Every four years a Magnet institution has to undergo an extensive reevaluation to preserve Magnet status. This poster will show how librarians have assisted in maintaining Magnet status through participation in various evidence-based practice nursing committees. Librarians from other institutions can gain insight on steps to take to begin or maintain Magnet status. Thank you Adele for your poster. We are beginning the Magnet process here at my institution and this poster provides some great tips for librarian involvement. Thank you for your thank you! I am happy that the poster provided you with some ideas for librarian involvement. 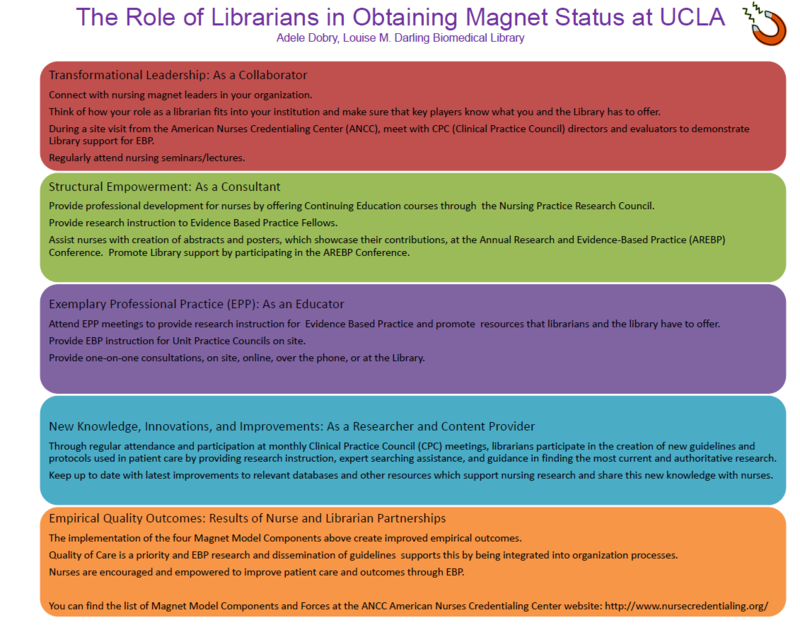 If you would like to know more about Magnet at UCLA or Magnet in general, I would be happy to talk with you and send you a list of articles that talk about librarians and magnet involvement as well. Thank you again for your comment! Please feel free to contact me at adobry@library.ucla.edu. Thank you again! Just read your reply about articles on librarian involvemnt in magnet. Would the references, especially after the ANCC conference last week!